This oil is used to add stability to a relationship. Relationships can be strained by a number of things; infidelity, long distances, moving in together, being newlyweds, etc. This is a twist on an old hoodoo recipe called "Across the Miles" with a touch of luv. Any sort of change can weaken our relationships and you need to act fast to keep it strong and prevent stagnation. This oil will send a message of love out to your partner and can heat up a cooled relationship and keep it growing! To warm the heart of another anoint 3 candles; white for intention, pink for true love, and orange to expedite your intention. Light all three candles and let them burn until extinguished. After this, anoint pink or purple candles with this oil each week to keep your relationship strong and moving forward. 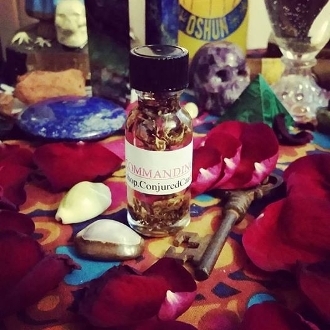 Created with jasmine, lotus, vanilla, vervain, and gardenia oils with pink rose, tonka bean, among other secrets;) Created under the invocation of the Virgen de Guadalupe and Oshun.